It has been a very dramatic weekend in Europe and the Iberian peninsula in particular last week. As the Catalans were voting for their independence, the Spanish government decided to crack down on the voters and peaceful protesters, with violence and force. With almost 900 people injured and shameful pictures released by the media, one would wonder how all this was helping Mariano Rajoy's conservative government in its cause. Even if they were justified in their objections to the Catalan independence referendum, they have certainly lost people's support not only in Catalonia, but in the rest of Europe too. Madrid claims-and rightly so- that the referendum was unconstitutional by law. But laws are not there not to be challenged and stay forever the same. If circumstances or the will and needs of the people are altered, then reforms or new realities have to be implemented. The Spanish government, after years of economic crisis, high unemployment rates, corruption, lack of opportunities for its youth and austerity, showed little competence in dealing with people's needs. That gave the perfect platform for separatists to gain momentum and push for their cause, just like in other EU nations we've seen the rise of "radical" political parties and movements. If there could be any solution to avoid such developments, it should definitely not involve violence. But dialogue, debate and deeper collaboration between the Madrid and the regional governments, plus between all of them and the citizens of Spain. It is fair to say that the Catalan government seized an opportunity to push for its agenda, which is based on financial control and power. Just like Britain always wanted special treatment within the EU and was complaining about its budget or how much it contributed into it, the Catalan government seemed to be in disagreement with Madrid over how much it pays. But when you belong in a state-federal or not-plus you are one of its richest regions, you always support the poorer ones. That is the case for every country. Take Finland for example. Its southern regions are much richer and developed than the northern ones and they keep supporting them financially. Such differences in the distribution of wealth and inequality, can be blamed on lack of resources or infrastructure in the poor regions, corruption or mismanagement. But if only each rich region wanted to break away from the poorer ones. We would not have a Europe of nations, but we would go back to a feudal, divided and fragmented continent. The difference with Spain is, that while from the outside looks a homogeneous country, in reality it is a multi-ethnic society, that has never had a proper debate and soul searching on its identity. From the imperial days to the dictatorship of Franco, the peoples of Spain as it seems, never had a dialogue on how to co-exist or manage their affairs. And that perhaps is why the EU, remained so quiet during these days. If Belgium, the U.K. or Spain, some of the union's oldest member states, cannot function as a federation, how can Europe succeed in creating a far bigger, more diverse integrated society and government? Perhaps we could learn by the mistakes of Spain to avoid repeating them and succeeding in creating a united Europe. But this country existed in its current form for centuries and if it has failed to convince the Basques or the Catalans to accept their dual identity, what chances does Europe have? Another major failure of the government in Madrid, is its lack of mobilization of the Catalan people who want to stay in the Spanish union. They seemed to believe that a violent crackdown of the voters would solve the problem, relying on the fact that the Spanish constitution prohibits such referendums. But it backfired on them. Maybe it would be better if they allowed the democratic process to take place, yet become active in it by encouraging the majority of the people who want to remain in Spain to go to the voting stations and cast their votes against independence. Only around 42% of the electorate has voted and from them 90% supported independence. If the other 58% was motivated to take part, maybe the outcome would be different. In addition, it could have started a positive campaign to convince the Catalan electorate, rather than arresting its elected officials. It is regrettable that the people of Spain, have been caught in a vicious internal power struggle of the local and central governments of their region. It is also sad to see that nationalism is rising in Europe in all forms. From Brexit, to Scottish and Catalan independence bids, the rise of the far Right and euro-skeptic political parties, xenophobia, anti-immigrant or refugee sentiments of fear, the crisis in Europe does not seem to subside. When will Europeans be able to feel comfortable in determining ourselves with multiple identities? One could be Catalan, Spanish and European, or Corsican, French and European. Instead of seeking constant fragmentation, perhaps we could just allow giving more freedoms and autonomy to people and regions, while maintaining a central form of government that will coordinate, not dictate all of them. The developments in Catalonia will no doubt affect the rest of Europe and the EU. 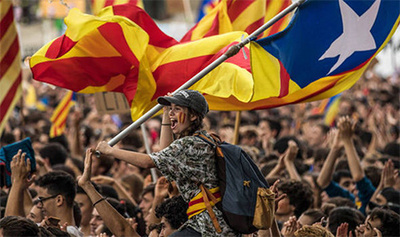 Apart from any economic, social and identity turmoil or instability that will most likely spill over to other Spanish regions with the same aspirations, many other parts of Europe may soon be inspired to follow suit. Or simply lose the appetite for European integration, seeing the failures of the Spanish government. Yet we need to remind ourselves of what happens with fragmentation. We could see the "Balkanization" of the Iberian peninsula, which could cause instability for the region and Europe itself, in a period that we are only coming out of a harsh economic crisis. It could take decades for Spain and Catalonia to settle their differences, even if the crisis does not escalate in an all out conflict. That could push the euro-zone recovery further back, with consequences that will be felt in all other member states. Therefore Europe must support and encourage the Madrid and Barcelona governments to settle their differences once and for all. Perhaps a radical and total rethinking of the way Europe and its nations are being governed is necessary, to avoid further and ongoing similar crises of happening in the future. It is time to stop burring our heads in the sand. Indeed, this seems to be the paradox: while there are countries waiting to enter the EU, separatist movement from the original country are becoming more virulent. Perhaps the EU bureaucrats have not grasped yet that cultural identity means more than mere political or financial power! Perhaps the famous exhortation "in order to form a more perfect union" needs to be analyzed carefully. Perhaps the question: what is a union for and is it worth the effort, needs to be asked and answered honestly.